Submitted by lynn on Wednesday, July 6, 2016 - 3:12pm. My former coworker (and fellow foodie) joined us at Dae Jang Keum for a farewell lunch before his move. The restaurant is located off the main Convoy strip and has been in business for 30 years in the Convoy area of San Diego. The current name is only 12 years old though, named after a korean drama according to a staff member. There was still parking around 11:30am but by the time we left, the small plaza lot was full! Here's the lobby into the restaurant. Dennis mentioned that the first thing he noticed was some kind of aroma, very different, yet somewhat familiar. More on that later. 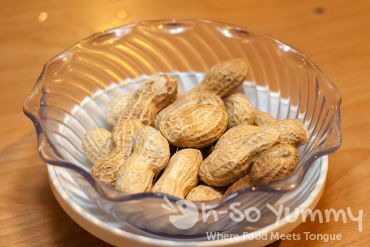 At the front of the restaurant, there's a huge barrel of complimentary peanuts which we munched on as we browsed the menu. 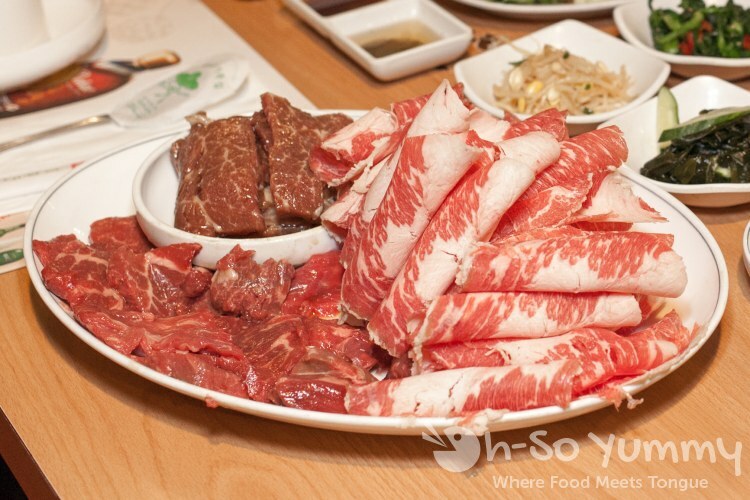 The options included various cuts of individual meat and ordering a combo seemed like the easiest plan forward. 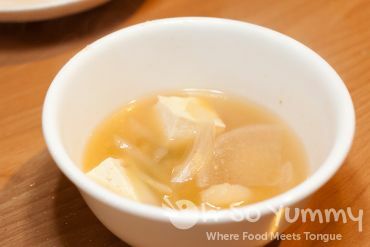 Our choice of Combo D came with "boild" soy bean paste soup, a very basic tofu and soft potato in broth to whet our appetites. Next came a nice assortment of banchan, nine in total, with some unusual items like tuna salad with corn (Dennis approved) and these cold black beans which I kept eating. They also had the typical steamed egg and salad with korean style dressing. 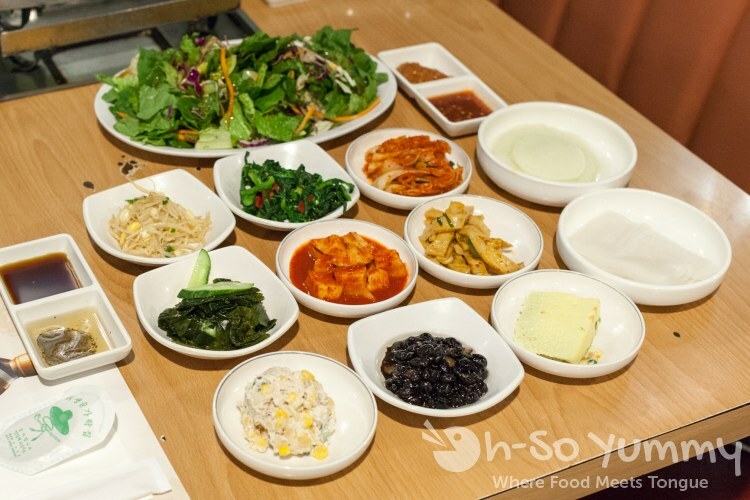 A variety of sauces provided additional sweet or spicy flavor for the meats. The meats were brought over on a cart. Too bad this wasn't our order... it looked massive! This was OUR meat plate for the combo! We were wondering when they would start heating the grill but instead the waitress brought out a smoking pan of charcoal to our table. Finally we had an answer to the origin of the mysterious scent Dennis mentioned! 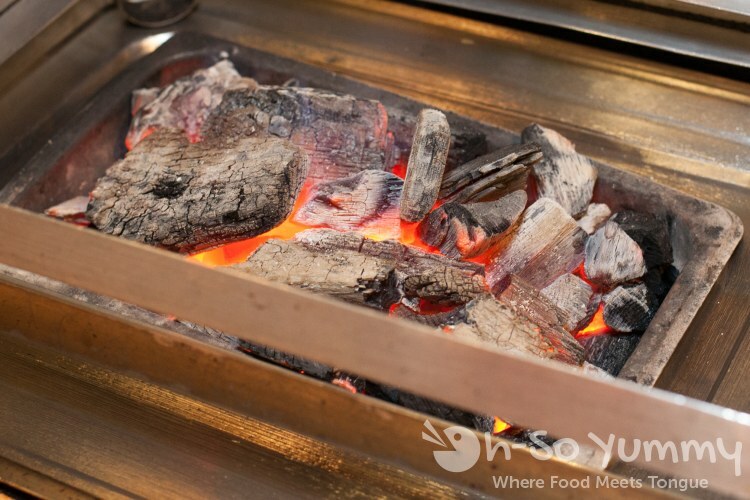 This is the first restaurant we've been to that uses charcoal for cooking our meat! 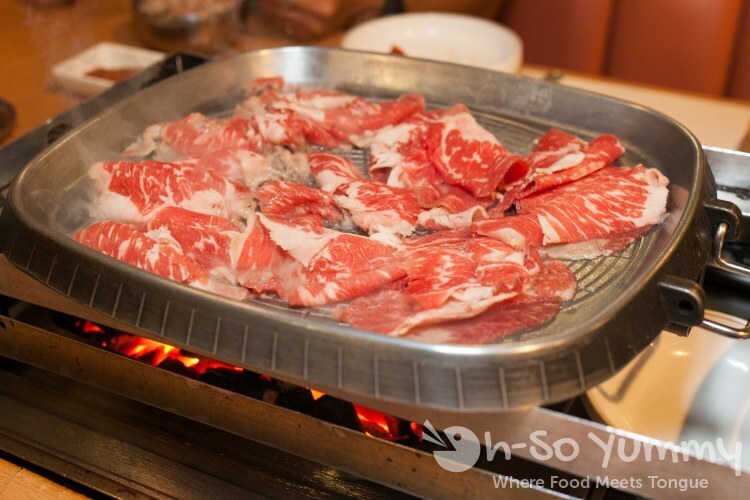 A metal pan was set above the coals and the waitress spread the raw beef brisket onto it. She helped turn the meat for a little bit before going to help another customer. Soon we were feasting on delicious meat. 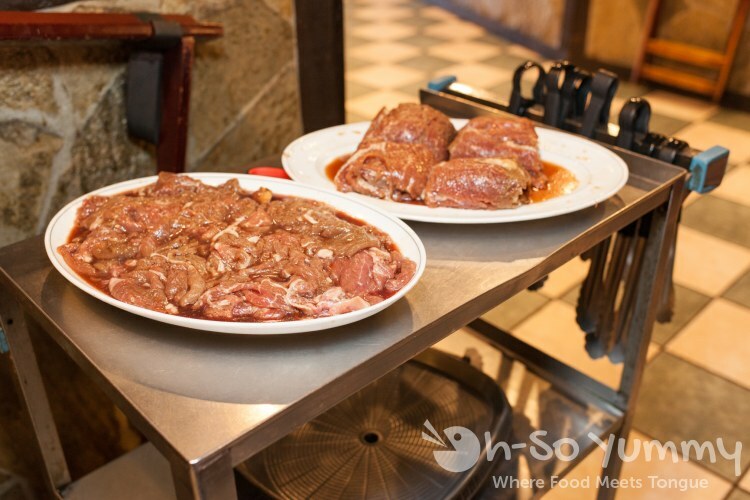 We were ready for the next course, beef with a touch of sesame oil, and began the second round. Our waitress came by a short while later and was in dismay that we had started without her! She helped transfer it to the CORRECT grill surface, which was a criss cross of wires, and we were once again on our way to grilled meat. This of course is where the heat source shines. The charcoal heat is penetrating the meat and that's where it's at! 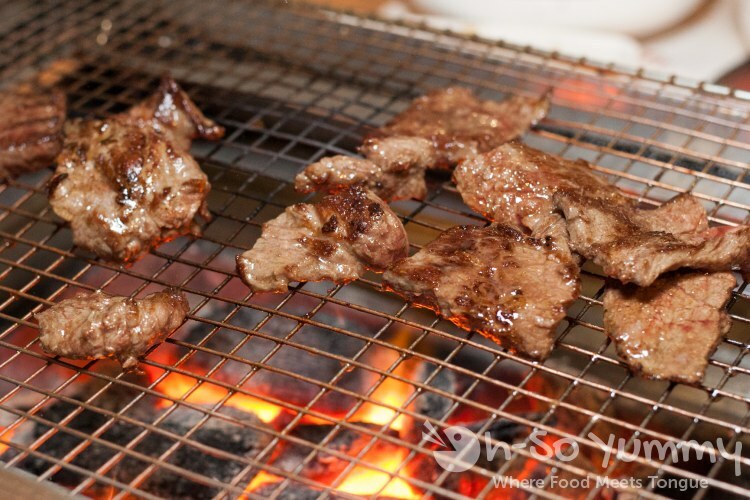 The meats got a really good char due to the charcoal and wire grill. The best meat was the marinated beef short rib. It looked so good cooking on the grill. We were quite filled by the end of the meal. What helped of course were the bowls of rice. This combo meal also came either a bottle of beer or soju. 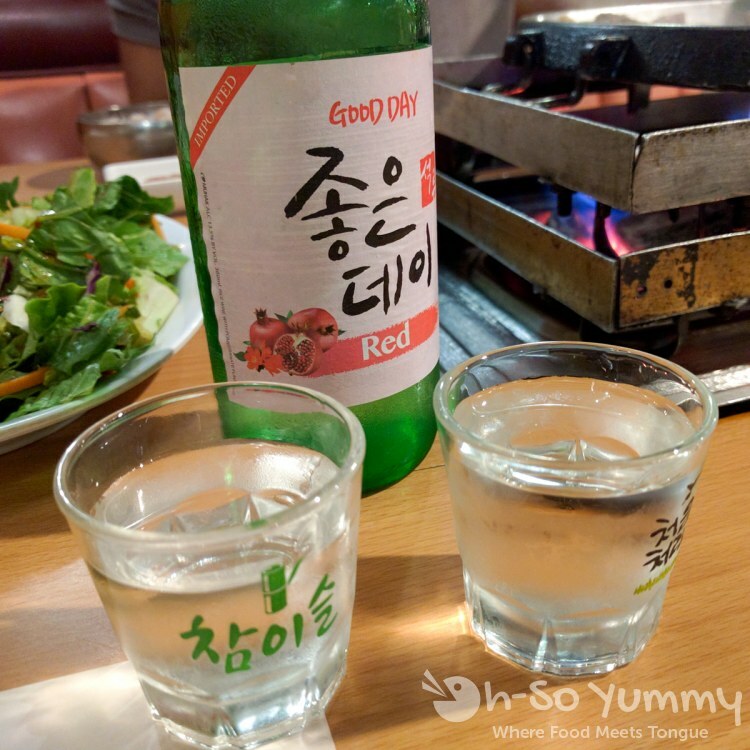 Soju sounded more fun with korean bbq so we were given shot glasses as well. This soju was labeled premium maple soju but did taste a bit like artificial sweetener. Still, one last cheers with our buddy until he comes back to visit SD! 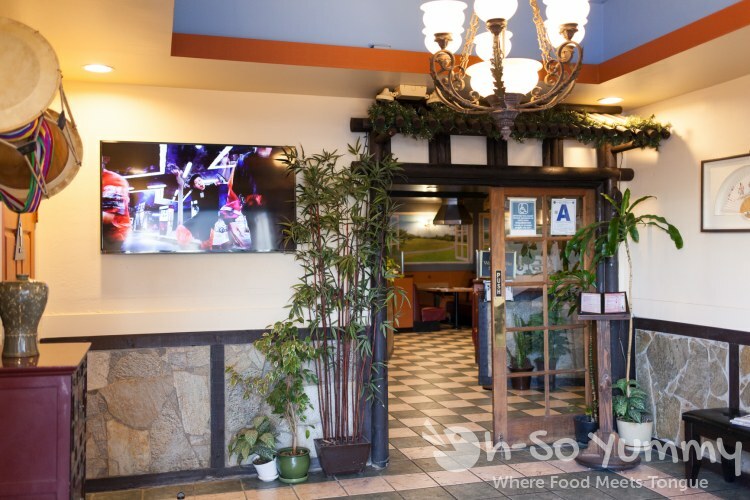 The meats are a little more expensive than AYCE like Taegukgi or Manna BBQ, totaling $80 before tax and tip, but the quality and the charcoal experience is the biggest draw! Not only that, but the service was super friendly. This is the most "help" we've ever received during the cook-your-own-food experience! The ladies working here were delightful and made us feel very welcome. Hopefully we'll be back to visit them soon and try out some individual items! 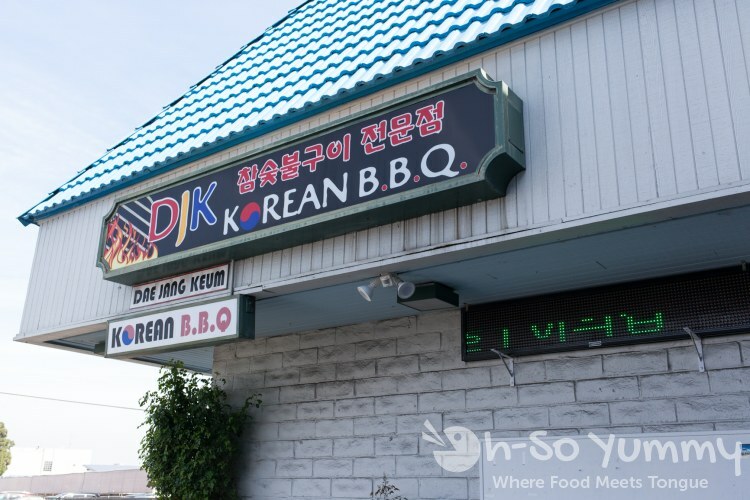 I've been looking for Korean BBQ here! I'll do anything for a good charcoal BBQ too... I haven't seen one recommended until now. Thanks!!! P.S. We need to go eat together one day soon! I recently ate at Tsuruhashi again and found out they have these japanese charcoal underneath their grill so another option to try. I had the bibimba (like korean stone pot) also and it's under $10! Not that much meat though but I like the mix! I wish they opened for lunch! I have such fond memories of this place. My dad took us here long ago and we were all amazed by the charcoal grill at each table. 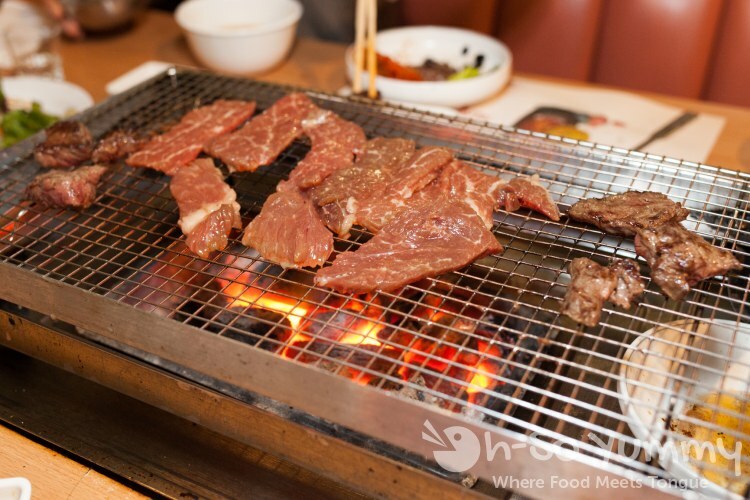 I just remember being scared to death when they'd transfer the coals unto the grill! I always wonder if they've had any freak accidents with the coals. The quality of their meats I remember being very good. 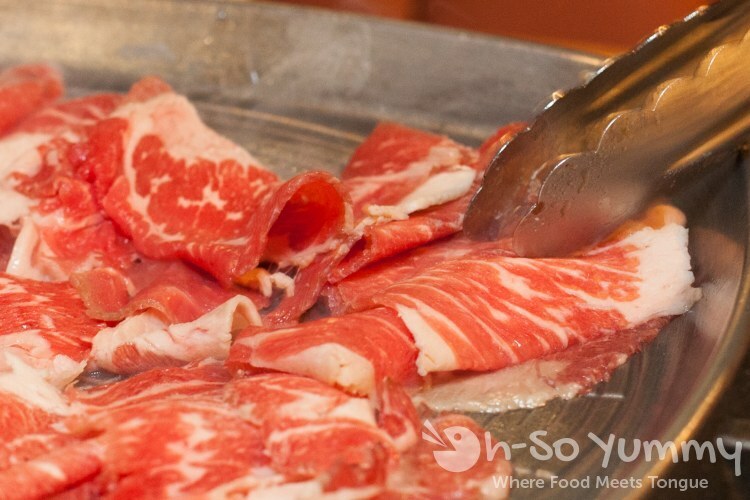 So it was $80 for 3 cuts of meat and soju? I'd be curious about their other combos. I definitely want to re visit this place after reading your post.